Based on open sources of information InformNapalm volunteers have discovered another provocative shelling of a residential building by Russian occupation troops. It is not the first time when Russian hybrid army shells civilian areas of DPR-held territories that are currently under control of Russian occupation forces. Friendly fire is frequently used by Russian media to create the image of “evil Ukrainian military who attack civilians” and, thus, shift public opinion towards blaming Ukrainian Army for atrocities in Donbas. 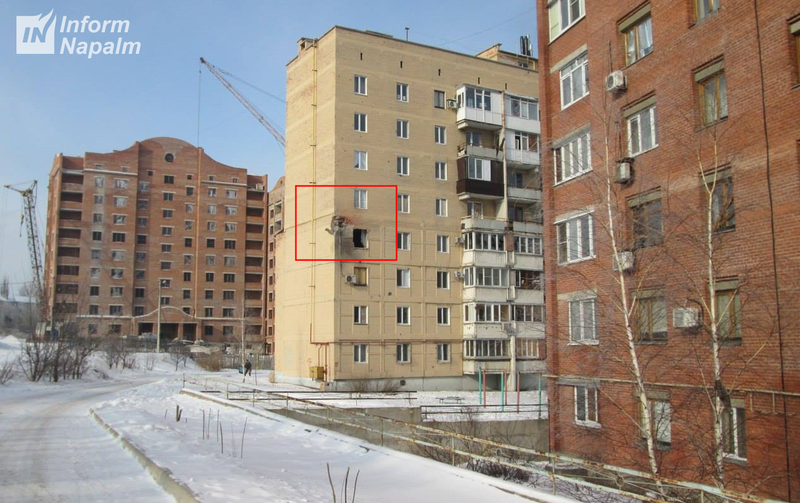 On February 1, 2017 local residents reported the hit of a 122-mm high-explosive fragmentation projectile into a corner of an apartment building located at 17 Lystoprokatnykiv Street of Donetsk (Ukraine), occupied by Russian forces since 2014. 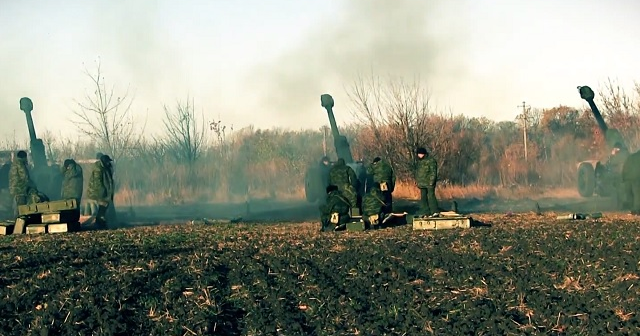 Now, if we mark a demarcation line between Ukrainian and Russian forces (liveuamap) and draw 15.4 km-long line (the maximum firing range of D-30 howitzer) in the direction of the shooting the resulting image will show that the firing position is located on territory that is currently under control of the Russian troops. Only a week ago, on January 31, 2017, Russian forces shelled the neighboring houses at the address 3A Lystoprokatnykiv and 10 Lystoprokatnykiv. Similarly, 122-mm high-explosive fragmentation shells were used. The fire was coming from the north-eastern direction. You can learn the details about this shelling from our previous investigation: Who and why shelling Donetsk: one incident. Russian occupiers continue employing a vile hybrid tactic of shelling city neighborhoods for the sake of creating propaganda news hooks suitable to stir up hatred towards Ukrainian Army and escalate the conflict further on. Russian hashtag of 2014 – #SaveDonbassPeople – was a cynical invention of “Russian World” architects seeking to cover up their atrocities with heart-piercing slogans while bringing destruction and death to Ukrainian Donbas. Creative Commons – Attribution 4.0 International (CC BY 4.0) Information was specially prepared for InformNapalm.org, an active link to the authors and our project is obligatory for any reprint or further use of the material. We encourage our readers to share our publications on social networks. Grounded investigations need to have more impact on public opinion. In the world swamped with fake news the truth should prevail.